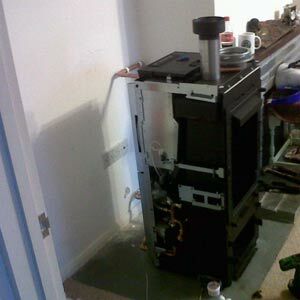 Here are a couple of pictures of a Duchessa wood pellet boiler stove which we installed down in Cornwall November 2011. Mike and Jamie (Stovesonline heating engineers) struck lucky because Andy, (Stovesonline trade and wholesale) has a brother down in Cornwall who runs a pub and B&B which was only 10 minutes from the job. They said it was a great place to stay although they were perhaps a little jaded before breakfast! The job was relatively simple and went smoothly. 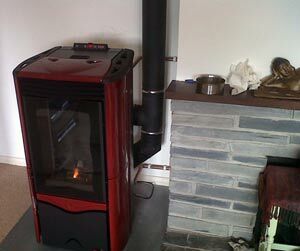 If there is a demand for heating or hot water then the pellet boiler switches on, just like a conventional gas or oil boiler. This is perhaps the most simple and straightforward way to install a pellet boiler stove into an existing system and means that you do not need to change the existing programmer which one is familiar with. Our client was very hospitable with both Mike and Jamie coming back raving about some home made coffee cakes which, they said, had a real caffeine kick that was welcome in the afternoon. attached to the stove after the install is complete. We now exclusively supply Klover wood pellet stoves and boilers.